« Chewies Steam & Oyster Bar Coal Harbour – Oyster Lovers Won’t Be Disappointed! 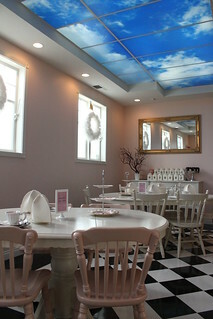 We were invited to try the afternoon tea menu at Adorabelle Tea Room in Steveston. It’s been opened since 2012 and frankly we didn’t know about it until we received the invitation. It’s one of the heritage sites in Steveston, where it used to be the townhall for residents to get together. 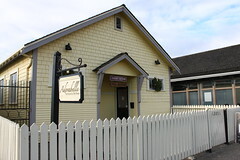 In modern days it was once a lawyer’s office, but it’s now in the hands of Adorabelle owner, Cathy, who has turned it into a cute, elegant tea room. 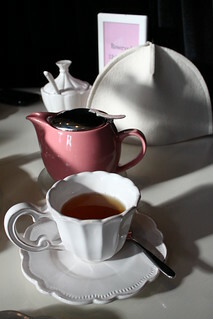 Like any other afternoon tea rooms, each person receives a pot of tea. 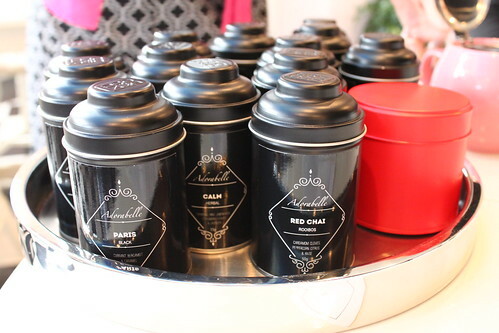 You get to choose from a unique selection of teas, and you will also be given the opportunity to smell them out of the tin before confirming your selection. Then, a pot of hot tea is delivered to your table, with a cozy to keep it warm. I thought that’s a nice touch, and I haven’t seen it done anywhere else. The afternoon menu comes with the following items, and the menu may change depending on seasonality. Ours was holiday-themed. Savoury: Bacon chive cupcake with savoury cream cheese icing, Asiago fennel biscuit, Egg salad pinwheel, Chicken Waldorf, Open-face cucumber, Smoked salmon dill cream. 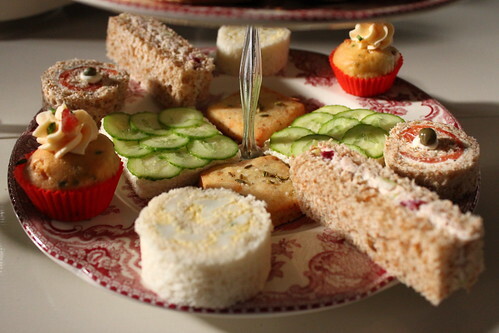 The finger sandwiches were standard flavours, but I thought they did them beautifully (e.g. the open-face idea for the otherwise boring cucumber sandwich). The surprise for me was the bacon chive cupcake and asiago cheese fennel biscuit. The savoury take on sweet pastries worked very well. 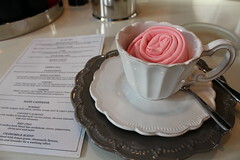 The cupcake was pillowy and of perfect bite size; the biscuit was buttery like a shortbread with cheese and subtle flavour from the fennel seeds. 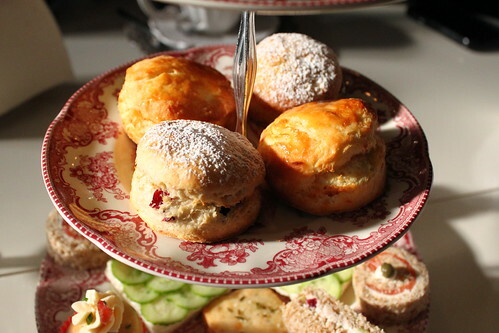 The scones were on the sweet side, but we really liked the flavours. I personally prefer the citrus glazed one because the flavour was more subtle and had a refreshing taste. The sweetened cream and strawberry preserves were an extra layer of indulgence! The strawberry preserves are made in-house and you can still see and taste each piece of berry fruit – we had to ask for more because we couldn’t stop eating it! The mint chocolate cake bite was my favourite on this plate. It wasn’t overly sweet yet gave you enough chocolate to satisfy your craving. The gelee also had a good balance of sweet and tartness from the passionfruit. I personally would’ve liked something more complex than strawberry and cream, but it tasted good anyway. I thought it would be an interesting, fun fact to point out that they serve you with a white glove on. It’s a subtle touch but it definitely adds more elegance to the overall experience. For $25 [Editor’s note: As of Nov 2015, the cost is $30 per person. 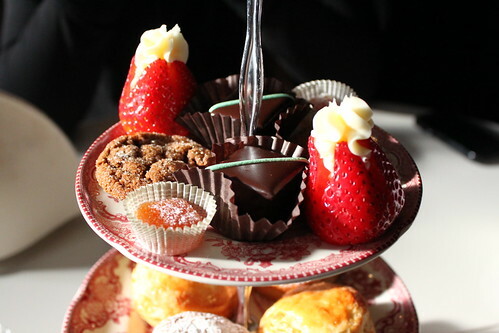 It’s still a good price for afternoon tea, but it’s starting to be rather comparable to many tea shops in Vancouver.] 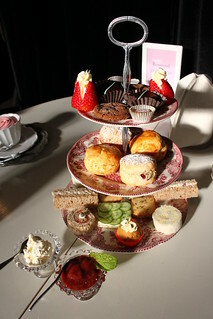 I thought Adorabelle offers a great value for afternoon tea. I really like the location, the story behind the heritage site, and the elegant yet adorable (lol get it??) interior decor. Now keep in mind that they only open Wednesday to Sunday with specific seating times, and it’s a one-hour service. Of course, if they are not busy you can probably stay longer. After all, this is the place to be back in the days for local residents to hang out. I would highly recommend you to check them out! This looks lovely! I will totally try it on one of our lovely bike rides around the area. You should definitely check it out. We had a good time there!